The Campos, grassland with few trees or shrubs except near streams, lies between 24°S and 35°S; it includes parts of Brazil, Paraguay and Argentina, and all of Uruguay. Grassland -based livestock production is very important, based on the natural grassland that covers most of the area. Stock rearing is on large, delimited holdings and is commercial. Both tussock-grass and short-grass grasslands occur. There is a dominance of summer-growing C4 grasses, with C3 grasses associated with the winter cycle. Cattle and horses were introduced in the seventeenth century and sheep in the nineteenth. Production is based on spring -summer growing grassland, with little use of sown pastures. Beef cattle predominate; sheep are mainly for wool, but some lamb is produced. Limited winter production and poor herbage quality are major limiting factors in livestock production. Soil phosphorus is generally low and this deficiency affects stock. Campos pastures are highly responsive to fertilizers, which can modify the specific composition of natural grassland; application of phosphate increases legume cover and the phosphorus content of forage. Fattening off grass can take up to four years; intensive fattening of younger stock uses some sown pasture. Sheep may be grazed with breeding herds of cattle. Exotic temperate legumes can be grown and may be over-sown into native swards after land preparation; once established, legumes encourage the development of winter grasses. This paper shows that it is possible to improve forage consumption from natural grasslands, implying an annual increase of 784 000 tonne of liveweight, without cost, in Rio Grande do Sul alone, through a strategy of high forage offer to the grazing animal, which also optimizes forage accumulation rates in the pasture. 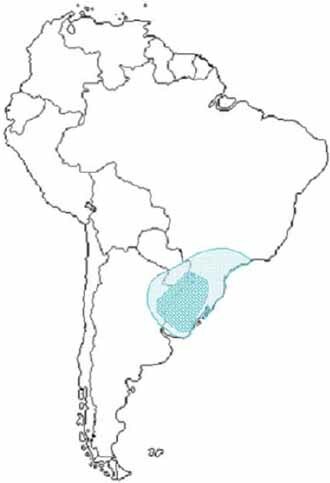 The South American Campos is an ecological region lying between 24°S and 35°S, which includes parts of southern Brazil, southern Paraguay and northeastern Argentina, and the whole of Uruguay (see Figure 5.1), covering an area of approximately 500 000 km2. The term Campos refers to grasslands or pastures with a vegetation cover comprising mainly grasses and herbs; scattered small shrubs and trees are occasionally found, generally by the banks of streams. The Campos region of South America. The grasslands of the Campos have enormous potential for cattle, sheep and horse production for meat, and for various wildlife products. This potential derives from the good environmental conditions, particularly the climate, which allows the growth of a great floristic diversity of edible plants that produce a huge bulk of forage throughout the year. The climate is subtropical to temperate, with very marked seasonal fluctuations; it is subhumid, because potential evapotranspiration in summer is greater than precipitation, which leads to moisture deficiencies in the soil. Although rainfall is distributed throughout the year, it is characterized by great variations between years; this irregularity is the main source of problems in forage production. The highest precipitation is usually in summer and autumn. Livestock production is one of the most important agricultural activities of the region, based on the natural grasslands that cover 95 percent of the area. Hence the great importance of this economic resource: its utilization in terms of maximum productivity while avoiding deterioration is an issue that concerns farmers, researchers and others with an interest in natural resource conservation. The Campos has a subtropical climate, very warm in summer but with frosts in winter. It is humid, often with moisture surplus in autumn and spring, but moderate deficits in summer (Escobar et al., 1996) Average annual temperature in Corrientes Province varies from 19.5°C in the south of the province to 22.0°C in the north. The average of the coldest month varies from 13.5°C to 16.0°C. Meteorological frosts are registered in the whole region, with low frequency, from one to six frosts per year, mainly in June and July, with records of first and last frosts from May to September. Average annual precipitation ranges between 1 200 and 1 600 mm, increasing from east to west. There is an unexplained increasing trend in mean annual precipitation; in the last 30 years autumn rainfall increased by more than 100 mm, while spring rainfall tended to decrease. Monthly rainfall distribution is variable: April, March and February have averages above 170 mm/month. A second rainfall peak occurs in October-November, with 130-140 mm/month, and lower values are recorded in winter. The moisture balance shows periods of excess (precipitation higher than evapotranspiration) in autumn and spring (March-April and September-October) and deficits in summer (December- January). Annual average relative humidity for all locations ranges between 70 and 75 percent, the lower values in summer and the higher in winter. Cattle stock is about 4.2 million head in Corrientes Province (Argentina) and 10.1 million in Uruguay, with little variation in recent years. Sheep stocks have been declining consistently, and in 1996 there were 1.2 million head in Corrientes and 13 million in Uruguay. Low wool prices, reduction in domestic consumption of mutton and farmers discouraged by sheep rustling are the main causes. The Campos Ecosystem, with abundant open tussock ranges and gallery forests along watercourses, provides a suitable environment for the development of a varied and abundant fauna. The great diversity of water bodies, flooded areas, small and big lagoons allowed the development of important populations of carpinchos or capybaras (Hydrochoerus hidrochaeris) in almost all the territory. Hunting of this animal for its valuable pelt is controlled by provincial authorities, and populations remain relatively stable. Deer are found in aquatic environments. Marsh deer (Odocoileus blastocerus) was an endangered species and now is controlled in protected areas in Brazil. In Uruguay, Ozotocerus bezoarticus is the typical deer. Other abundant species are yacares (Caiman spp.) and river wolves (giant otters, Pteronura brasiliensis). On the grassland part of the Campos there are armadillos (Dasypus spp. ), viscachas (Lagostomus maximus), hares, foxes, partridges, rheas and ducks, which are rarely harmed by humans. Within the Campos there are various econiches, defined more by inherent botanical composition than by effect of use. The dominant vegetation in Corrientes is herbaceous, with few or no trees and shrubs, except for the Ñandubay forest. Hence the name Campos or Campos limpios. Perennial summer grasses dominate, with sedges next in importance, and are found in every grassland of the region. There are numerous legumes, but at very low frequencies. More than 300 species from 39 botanical families have been listed in the herbaceous strata (J.G. Fernández, pers. comm. ), which reflects the great floristic diversity and botanical richness of these grasslands. Perennial grasses contribute 70-80 percent of the total dry matter (DM) yield; Cyperaceae follow, with 7 percent on higher ground and up to 20 percent in the marshy, low-lying wetlands (malezales). Legume contribution is always low, ranging from 3 to 8 percent of total DM yield on higher ground, and is practically nil in the lowlands of the malezales. In the Rocky Outcrops (afloramiantos rocosos) zone, natural grasslands have been regularly studied since the mid-1980s. In a grazing trial on 70 ha, 178 species were noted. The three most important grasses were Andropogon lateralis, Paspalum notatum and Sporobolus indicus. Other important grasses were Paspalum almum, P. plicatulum, Coelorachis selloana and Schizachyrium paniculatum. Other species seldom contributed more than 10 percent of total biomass. Desmodium incanum was the only legume that regularly contributed to summer forage. The most abundant Cyperaceae was Rhynchospora praecincta. A greater range of species contributes to the total biomass of short-grass grasslands, although three grasses - Paspalum notatum, Sporobolus indicus and Axonopus argentinus - are the most frequent. An important feature of this grassland is that winter grasses can contribute from 3 to 20 percent of winter forage, depending on grazing management. The commonest winter species are Stipa setigera, Piptochaetium stipoides, P. montevidense and Trifolium polymorphum. Cattle and horses were the first domestic herbivores, introduced by Spanish settlers at the beginning of the seventeenth century; sheep arrived in the mid-nineteenth century. The introduction of domestic livestock to the natural grassland ecosystem has changed the vegetation type, as grazing is the main factor that keeps the grasslands in a herbaceous pseudoclimax phase (Vieira da Silva, 1979). Exotic plants, mainly from Europe, were introduced along with livestock, increasing the disturbance. There is little information about the characteristics of the grasslands previous to the introduction of domestic herbivores. According to Gallinal et al. (1938) We do not know descriptions or precise indicators of existing vegetation prior to livestock introduction nor from the native immigration over areas that now are Campos . Some imprecise references to vegetation were made at the beginning of nineteenth century by travellers such as the foreigners Azara, Darwin and Saint Hilaire, and by criollos such as Father Dámaso Antonio Larrañaga. From their descriptions it can be deduced that there were no forest zones, except for the banks of rivers, and that the landscape was characteristically a prairie with some small trees, shrubs and sub-shrubs. In an exclosure made in 1984 at the INIA Experimental Unit of Glencoe, Uruguay, (32°01'32.S and 57°00'39.W), where grazing was excluded on land that had been grazed for centuries, tall bunchgrass-like plants began to increase and short-grasses showed reduced cover. There was also an increase of sub-shrubs and shrubs such as Eupatorium buniifolium, Baccharis articulata, B. spicata and B. trimera, while B. coridifolia decreased, as it is a species that thrives when grasses are weakened by grazing. B. dracunculifolia, a shrub of three metres, which has branches that are easily broken by domestic herbivores, was found after six years of exclosure. The population of B. articulata remained stable for five years; thereafter all the plants died almost simultaneously, but after a similar period, the population re-established and died again, and now there are new plants developing. Original plants of Eupatorium buniifolium remain, and there are other, younger plants. The size of the grass bunches increased and the number of individual plant decreased, as shown by Stipa neesiana, Paspalum dilatatum, Coelorachis selloana and Schizachyrium microstachyum. There is a great development of grasses that were of very low frequency and rarely flowered under grazing, such as Paspalum indecorum, Schizachyrium imberbe and Digitaria saltensis. Native legumes, although of low frequency, also increased in vigour. The continued exclusion of grazing leads to increased litter accumulation, which changes the moisture retention capacity of the soil markedly. This effect, coupled with taller grasses, modifies the microclimate. The interruption of a factor that has driven vegetation to a new equilibrium point returns it to an earlier stage, but not exactly to the same starting point (Laycock, 1991). The situation after two decades of exclosure might be similar to that prior to domestic livestock introduction. The structure of the main grassland types of the Mesopotamia Region of Argentina was described by Van der Sluijs (1971). A paper on Grassland types in the Centre-South of Corrientes was published by INTA Mercedes (INTAEEA, 1977). Two different canopy structures are found, determined by the growth form and habit of the dominant species. On the one hand there are the tussock prairies, called generically pajonales (straw), with Andropogon lateralis being the commonest species, and there are grasslands dominated by Sorghastrum agrostoides, others by Paspalum quadrifarium and others by P. intermedium. These are typical of the ecological regions of Albardón del Paraná Sandy Hills (lomadas arenosas); with lateritic hills and malezales on higher sites. On the other hand there are short-grass grasslands, where dominant species rarely exceed 30-40 cm in height. Here the commonest grasses are Paspalum notatum, Axonopus argentinus and Sporobolus indicus. Long-term overgrazing causes grassland deterioration, which leads to a lower canopy, reduced floristic diversity and reduced vegetative growth. In this situation, flechilla becomes the dominant grass (Aristida venustula), so these grasslands are named flechillares. Deteriorated short-grass grasslands dominate the centre-south of the province, in the Rocky Outcrops regions and Ñandubay forest. Intermediate situations are found between the two grassland types, where pajonales and short-grass are mixed. These are mosaic grasslands, characteristic of the floramientos region. Pajonales Mean annual production was 5 077 kg DM/ha. 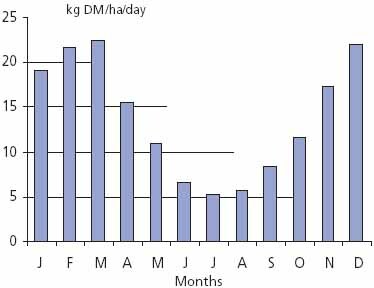 Average monthly growth (Figure 5.2) showed regrowth in every month, including winter, when growth was 5 kg DM/ha/day. The average monthly growth rate was at a maximum in February, March and December. Growth rate distribution through the year correlated positively with monthly variations in temperature, showing an autumn peak higher than the spring one. Variability between years is high, particularly in summer, which is related to rainfall variation and high temperatures. Grassland production of the main grassland types of the northwest of the province was studied by Gándara and co-workers (1989, 1990a, b). These authors evaluated three pajonal-dominated sites: malezales, Corrientes and Chavarria, and mean aboveground production for four clipping frequencies was 5 260, 4 850 and 4 120 kg DM/ha/year for the three sites, respectively. Short-grass Average production of a short-grass grassland was 5 803 kg DM/ ha/year, with great variation between years and an increasing trend over time (Figure 5.3). Maximum growth rate was attained at the end of the summer or early autumn (February-March), when growth rates were estimated at 25 kg DM/ha/day. July was the month with least growth; it was estimated at 5.5 kg DM/ha/day. Yearly forage production showed an increasing trend over time, but this could be related to an increasing trend in annual precipitation over the same period. Such an increase could lead to a progressive increase in carrying capacity. Nevertheless, the most remarkable conclusion from the data is the great inter-annual variability. Flechillares Average production of the flechillares was 2 774 kg DM/ha/year. The highest growth rate was in February and March, followed by December; the lowest in June-July. This grassland has a seasonal distribution similar to the original short-grasses but has a proportionally better growth distribution between winter and spring. The carrying capacity of such grassland is low, and it becomes critical in years when rainfall is below average. Average daily growth rates of a Pajonal grassland (19-year average). 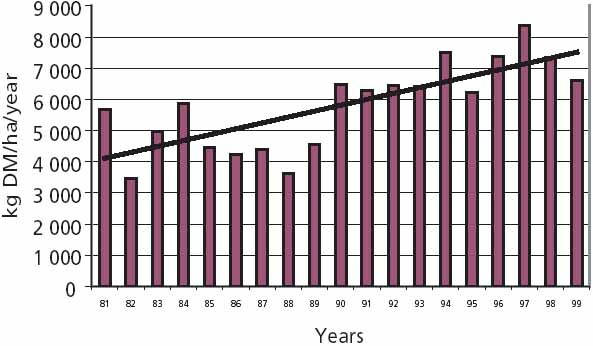 Yearly growth rate of a short-grass grassland over a 19-year period. Livestock production is based on the use of spring -summer growing grassland, with little use of sown pastures or other supplementary sources of feed. The main production system is a mix of breeding and fattening, with increasing preference for breeding. Specialized fattening systems are irrelevant. Predominant breeds are Zebu-based, followed by European breeds, Indian breeds and criollas. The main systems are characterized by low production efficiency. The average extraction rate for sale is only 18.9 percent, while the national average in Argentina reaches 23 percent. Sheep rearing is mainly for wool, and to a lesser extent for lamb. A cattle -sheep production system is applied by 3 400 farmers in the centre-south of the province. Predominant breeds are Corriedale, Romney Marsh and Ideal. Lambing rates in Corrientes average 60 to 65 percent, with a mean greasy fleece weight of 3.18 kg/head. Provincial sheep stocks have declined in recent decades, following the same trend as the national stock. The sheep stock in 1993 was 1.39 million head, with a greasy wool production of 4 427 000 kg. Productivity levels are low when compared with potential productivity in this environment. The reasons for this have been analysed by Royo Pallarés (1985), who indicated a series of environmental, social, economic and technical factors as the causes of low productivity in an economic inflation scenario. Gándara and Arias (1999) noted recently that resource mismanagement, limited adoption of improved technology, lack of service structures, poor cattle markets and small farm size were factors determining low productivity. Many authors have reported productivity increases when some basic management technologies have been applied (Arias, 1997; Benitez Meabe, 1997; Royo Pallarés, 1985, 1999). In the north of Corrientes, average productivity at subregional level is 30 kg/ha/year, while at the Experimental Unit, where basic management practices were applied, 67.7 kg/ha/year were obtained (Table 5.1).